This is the debut solo release by versatile cellist Alison McGillivray who is joined by a trio of Baroque specialists: cembalist David McGuinness, continuo cellist Joseph Crouch and baroque guitarist Eligio Quinteiro. 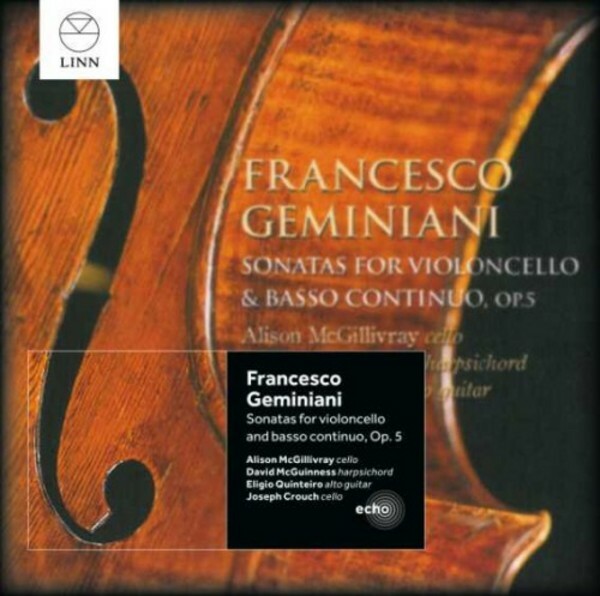 Originally released in 2005, 'Geminiani: Sonatas for Violoncello & Basso Continuo, Op.5' has been re-issued as part of Linn�s ECHO series which offers a second chance to enjoy the best of the label�s award-winning catalogue. The FT named McGillivray's eloquent Geminiani recording one of the �Best Classical CD of 2005� for its �scholarship and style�. Geminiani�s Op.5 mark the beginning of the change from gamba to cello. They are an intriguing and delicately balanced fusion of Italianate clarity and counterpoint and French lavishness of sonority and gesture. In the Op.5 Cello Sonatas Geminiani succeeded in creating music that lives up to his own high expectations. In addition the players perform some interesting and valuable bonuses taken from Geminiani�s keyboard compositions. Alison McGillivray is an internationally recognised baroque cello and viola da gamba player. She has worked with many Early Music groups and is an integral player in several highly regarded UK ensembles, including Concerto Caledonia, Academy of Ancient Music, The Early Opera Company and the viol consort Concordia. Her recordings include Mozart piano quartets with Sonnerie, Gibbons viol music with Concordia, Scottish baroque music with Concerto Caledonia and CPE Bach�s A major cello concerto with The English Concert.